(PhysOrg.com) -- By installing millions of sensors throughout a city and hooking them up to an urban operating system, the Portuguese-based company Living PlanIT envisions that, in the future, cities could monitor and manage themselves more efficiently without the need for additional human supervision. For instance, in the event of a fire in an occupied building, sensors would spot the fire and then flickering lights and alarms would direct people to a safe stairwell and an exit. At the same time, a fire station would be notified and the system would manage the traffic lights so fire engines could reach the building as quickly as possible. In this way and others, sensors around the city could keep an eye on whats happening and keep things running smoothly. The plan involves using sensors for monitoring everything from traffic flow, energy consumption, water use, waste processing, and the temperature of individual rooms. All these sensors would be connected to the Urban OS, enabling them to communicate with each other. The Urban OS was developed by McLaren Electronic Systems, which makes sensors for Formula One cars. According to Living PlanIT, this kind of smart city could lead to cost savings while improving the quality of life for the people who live there. 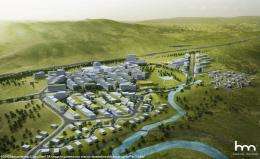 The company is currently building a demo city called PlanIT Valley, located in southern Portugal near the town of Paredes. Although it will take several years for the city to be built, Living PlanIT hopes that the final outcome will be a city that is more environmentally, socially, and economically sustainable than todays cities. To support the many applications such a system could have, the Urban OS will run PlaceApps, which is the urban equivalent of apps on a smartphone. Independent developers could also create their own apps for specific uses. Eventually, smartphones could connect to the Urban OS to monitor and control household appliances and energy systems. All this will be possible, according to Living PlanIT, while simultaneously protecting peoples security and privacy. The World Economic Forum recently selected Living PlanIT as one of its Technology Pioneers of 2012 for its work in developing smart cities. it's a perfect time to build new cities too. Next time a hurricane hits some low lying area we should built the city of the future on some safer ground. What is R.O.I. probability timeline average for retrofitting? If a city is wiped out the residents can rebuild it any way they'd like. Leave me out of any grand, centrally planned or managed, city. Additionally, city wide cameras would make the city safer, but you can leave me out of the surveillance society, as well. Liberty is far more important that safety, and you cannot have both, in any great degree. I think it's good, there needs to be a limit to what is being constantly surveyed though. The idea of tying fire and emergency systems into traffic management systems is worth pursuing. More than just having emerg given green lights, traffic can actually be thinned along the route. Sounds like a good idea. Some of the other ideas sound a bit intrusive or without obvious need. Some of these new technologies like using microphones to detect and locate gunshots where humans might be too frightened to get involved calling police might also be usefully tied in, again, allowing police to have less traffic as they respond. Maybe garbage cans could call in when full. I think there will be a lot of great and foolish ideas from this that need to be sorted through.